This cheerful apartment for four people is located in a residential and tranquil area, called The Putget. It is very well-connected by metro and bus to the city centre of Barcelona, and is only a 15 minute walk from the downtown area and Las Ramblas. 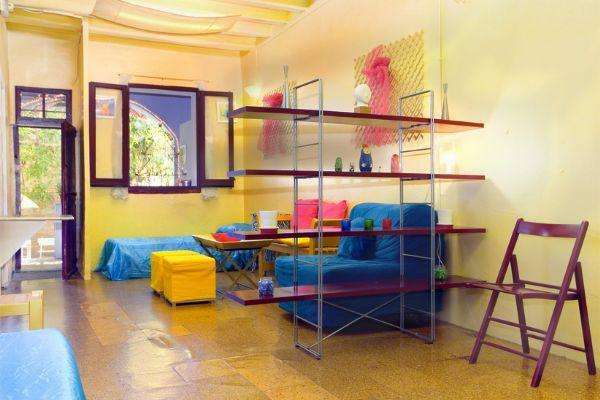 This lovely apartment is very cozy and decorated in bright colours, perfect for a family with children. It has a large terrace where you can relax and enjoy your meals outside or soak up some Spanish sun. The main room has a TV, seating and a comfortable sofa bed. You can also find a single bed under the window and a double bed in a quirky alcove of this room. If staying in touch with friends and family back home is a priority, Wi-Fi is also available. The kitchen is well equipped with a cooker, refrigerator, microwave and toaster as well as pots, pans and cutlery. The bathroom is tiled, with a walk-in shower. There is also a separate dining area decorated in a bright pink colour. This apartment is a great choice for a family looking to visit Barcelona while staying in a quieter area outside the city center.